Maisey Campbell Napaltjarri was born in Papunya in 1958 and belongs to the language group Ngatatjara and she comes from the Warmurrungle region. Maisey was married to Barney Campbell Tjakamara, a famous Western Desert Artist who passed away in 2006. 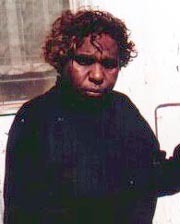 Maisey was born in Papunya and has two daughters. Her father was Ngatatjara and mother Lritja. She paints her father’s country at Warmarrungle near Kaarku. Maisey Campbell is becoming increasingly popular and her paintings can be found in galleries nationwide. Selected Exhibitions: 2006 Japingka Fine Art Gallery, Alice Springs "Towards Black & White"